We’d love your help. Let us know what’s wrong with this preview of Original Thinking by Glenn Aparicio Parry. In Original Thinking, Glenn Aparicio Parry delves into the evolution of Western thought to recover the living roots of wisdom that can correct the imbalances in our modern worldview. Inspired by groundbreaking dialogues that the author organized between Native American elders and leading-edge Western scientists to explore the underlying principles of the cosmos, this book In Original Thinking, Glenn Aparicio Parry delves into the evolution of Western thought to recover the living roots of wisdom that can correct the imbalances in our modern worldview. Inspired by groundbreaking dialogues that the author organized between Native American elders and leading-edge Western scientists to explore the underlying principles of the cosmos, this book offers a radical revisioning of how we think. Asking questions such as, Is it possible to come up with an original thought?, What does it mean to be human?, and How has our thinking created our world today?, Parry challenges us to consider many of our most basic assumptions. To think originally--as in thinking new thoughts that have never been thought or said before--is according to Parry, largely an illusion. So, too, is the idea of linear human progress. Most of us have traveled far from our ancestral lands, and in so doing, lost connection with place, the origin of our consciousness. 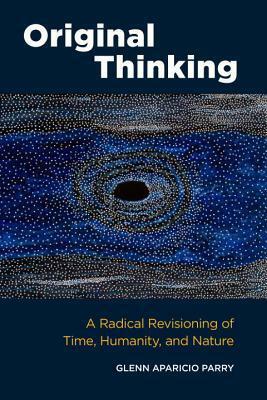 Original Thinking offers a radical revisioning of how we think and what it means to be human. It invites us to reintegrate our hearts with our heads and to expand our self-imposed narrowing of consciousness. In doing so we reconnect with the living, original source--nature and her interconnected elements and cycles--and embrace the communion of old and new, rational and intuitive, and masculine and feminine. Ultimately, Parry shows us how to create the tapestry of truly original thinking and to restore thought as a blessing, as a whole and complete transmission from Spirit. PART ONE (ORIGIN): Is it possible to come up with an original thought? PART TWO (DEPARTURE): What does it mean to be human? Chapter 13. Re-Thinking the "Dismal Science"
PART FOUR (RENEWAL): Can education promote the renewal of original thinking? To ask other readers questions about Original Thinking, please sign up. Original Thinking: A Radical Revisioning of Time, Humanity and Nature by Glen Parry, seeks to address the disconnectedness in Western-dominated thinking by reconnecting with earlier indigenous and Eastern conceptions of interdependence with the world around us, while emphasizing new discoveries, especially in the field of Quantum Mechanics, that give credence to many of the ancient ways of thinking. This thinking is not new, but rather thinking that connects us with our point of origin, challenge Original Thinking: A Radical Revisioning of Time, Humanity and Nature by Glen Parry, seeks to address the disconnectedness in Western-dominated thinking by reconnecting with earlier indigenous and Eastern conceptions of interdependence with the world around us, while emphasizing new discoveries, especially in the field of Quantum Mechanics, that give credence to many of the ancient ways of thinking. Is it possible to come up with an original thought? Has our thinking created the world today and what is now emerging? Can education promote the renewal of original thinking? These are good questions, worthy of thought, and differing perspectives are welcome. Seeing things with new eyes is an overarching purpose of education, growth, religion, and ultimately redefinition. And challenges to an increasingly globalized, dissonant way of thinking is appreciated. So I enjoyed Parry's work on a superficial level, and his commitment to challenge current ways of thinking and experiencing reality have caused me to consider my own approach to life. However, I believe that Parry makes the same mistake many do, when seeking to rebuild human frameworks from "point of origin." He's reading, writing, and understanding this point of origin seeking to separate from today's Zeitgeist (spirit of the age, spirit of this time) without first recognizing that many of his assumptions about revisioning time, humanity, and nature are in fact a product of the spirit of this time. This is not necessarily a bad thing, but in my opinion, one's failure to comprehend their "place of origin" or "time of origin," while seeking to return to the thinking of humanity's "point of origin" ultimately leads to neither original (as in origin) thinking or original (as in unique, fresh, innovative) thinking. Each of us must first recognize that we are a product of our age, before we seek to understand the wisdom of a previous age. Failure to do this results in a lack of deep thought, a failure to synthesize the wisdom of the previous age. Instead, we simply paste that wisdom onto the framework of our own preselected suppositions. That's precisely how Parry's thinking comes across to the reader. He's not challenging our thinking with origin or innovation. He's simply creating a curious amalgam of thought that is neither twenty-first century philosophy or science, nor original thinking from the ancients. Instead, Parry has left us with a twenty-first century mysticism all too prevalent in our current age, that refuses to adequately address the deeper questions of today's world. It is simply a panacea that soothes our conscience without challenging us to work toward the needed change that will ultimately improve our world. By "original thinking," author Glenn Parry is not referring to innovative thinking but rather thinking which is "reconnected with a deep place of origin." In his book of the same title, Parry seeks to help us "remember" our original connectedness – nonlinear, beyond-the-rational thinking, in which head is integrated with heart, in sync with nature, and emerging out of wholeness. "Could Western society be confusing distance from origin with progress?" he asks us. Can we reawaken to kairos time, in which past, present and future are fused in timeless awareness? Can we get out of our own way so that "large forces can come through and restore balance?" ORIGINAL THINKING developed in part from thirteen years of Language of Spirit dialogue conferences between indigenous elders and western scientists, as sponsored by the SEED Institute which Parry founded. Physicist David Bohm and native American elders such as Leroy Little Bear and Navajo elder Leon Secatero considerably influenced Parry's thinking. The work of these dialogues continues today via the Circle of Original Thinking (originalthinking.us) in Albuquerque, Parry's home base. ORIGINAL THINKING consists of four interrelated parts: Origin (exploring our perception of time), Departure (separation from nature), Return (separation in thought) and Renewal (restoring holistic thinking and interconnection through education). Throughout, Parry elucidates the false assumptions that underlie the sickness manifesting on our planet and in our psyches – e.g. that progress is linear, that instinct is a lesser way of knowing. Parry covers such topics as the manner in which western languages reinforce a faulty separation between past, present and future, the distortion of the meaning of economics from its original caring and holistic roots, and the narrowing of human consciousness through academic and technical specializations. ORIGINAL THINKING is an important book. In regard to the concepts it presents and the diagnosis of our contemporary pathologies, I'd rate it above a 5 on a 5 point scale if I could. But in regard to writing style and layout, it deserves only a 2. This is a difficult and often tedious book to read. "...intelligence and the capacity for language ought not to be evaluated by predetermined means that are specific to species or a particular subset of a culture. We assume that certain kinds of language and intelligence are more advanced, such as the vocalization of abstract thought through words or the expression of words in writing. Animals (and even other humans) who operate differently are prejudged as inferior without due consideration of the diversity of means of expressing linguistic intelligence." The above writing style does not convey that message that Parry seeks to convey. It does not speak to the whole self. Likewise, the layout of the book is at odds with Parry's message. Although a few Native American allegories are included, the book design does not distinguish them in any significant way from the dense text – nor does it have a user-friendly layout with inset text boxes containing inspirational quotes, graphics, larger type etc. or even more space on the page to create breathing room for reflection. The book design and style are at odds with the message. Granted, the style and layout help differentiate the book from saccharine new age books with similar but less substantial messages, but surely there is a middle ground between the "hippie dippie" and the scholarly. For readers expecting the book to be a meeting ground between quantum physics and Native American thought (as if all such tribal viewpoints can be meshed together under one heading), it fails to meet such expectations, since it barely presents quantum physics and its relation to human consciousness at all (I address the subject much more thoroughly in a chapter on fate and free will in my book, THE ASTROLOGY OF SELF-DISCOVERY, and I am no quantum physicist!). It also lacks what I would view as an essential bridge between our current situation and awakening of "original" views –a discussion of how we can more deeply hold the beliefs and attitudes that Parry presents while living in THIS world – relating to ordinary people and working in our present economic system. But ORIGINAL THINKING has many strengths. Its message is essential for healing our psyches and our planet. It does effectively elucidate a number of indigenous viewpoints in a manner that is not "flaky" and can significantly influence the consciousness of readers. It also includes a variety of inspirational quotes from thinkers of various traditions such as Krishnamurti and Gregory Bateson. Near the end of the book, Parry summarizes the new assumptions he believes we need to adopt in regard to humanity (e.g. "Each human being is unique but not of wholly separate consciousness"), nature (e.g. "All of nature is interdependent....Nature is an undivided whole"), and education (e.g. "History is still reverberating in the present; no event is completely over."). In one of the last chapters, "A New and Ancient Vision," Parry even becomes eloquent: "In order to recover from the pollution that we have inflicted upon ourselves and the Earth, we need to first examine the pollution within our own minds...the roots of our thinking, the misplaced assumptions and beliefs.........Until we really feel deep inside us that we are the death, we are the water, we are the air and fire, we may never care enough to change our behavior toward the planet, which is really ourselves." “The reality is that every time we manipulate nature's rhythms, we create unintended consequences that then require us to make still further changes."